Okay, it's a bakery, that alone was enough to get me in the door. And seeing their wide selection of sweets and treats at affordable prices, you know I was hooked. My first time in, it took me some time to survey all the offerings before zeroing in on one thing in particular to try. That's right, an eclair. I know it is not exactly Russian, but it was big, bursting with cream filling and all for just under $3. It's a nice crispy on the outside, fluffy airy inside shell covered in thick layer of chocolate that is more like frosting (mmm...frosting) than just plain old melted chocolate on top. The thing that got me when I first had it was they did not skimp on the filling. Years ago it was a delicious thick custard cream. There was always enough to go with every bite and usually some left over to eat like a pudding. The filling has changed some over the years and these days it is more like a whipped custard, making it lighter but still thick enough to know you are getting a hefty dessert. Even with the new filling, they still aren't skimping on it. It is chock full from front to back. 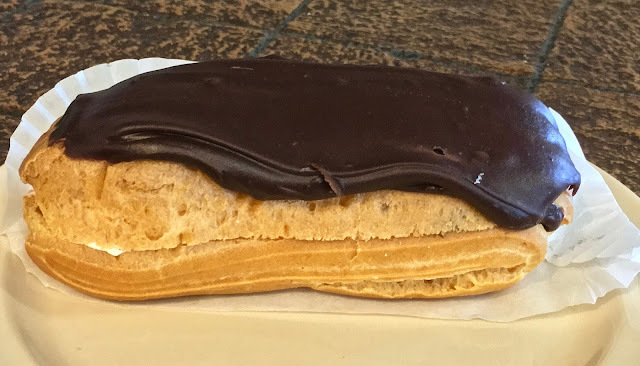 They've gone up to $3.50 now, but comparing it with some of the other offerings around town, the eclair is still a tasty bargain to highlight a trip to this side of town. A must try are the piroshki--deep fried dough filled with cheese, meat, cabbage, mushroom or various combinations there of. They usually have 4 or 5 filling choices to choose from and best of all, these big handfuls are only $2.50. The dough isn't too thick and the fillings are ample--I like cheese or cheese and beef the best which kind of tastes like an old school greasy hamburger. They are also best served warm. If you eat in they will heat it up for you. 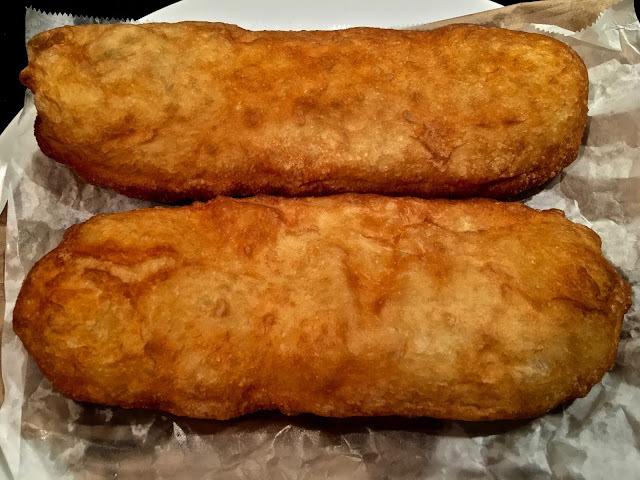 They are like a giant Russian hot pocket and big enough to satisfy your appetite. This last time there, I decided to try something I'd look at, contemplate and then ultimately get something else--the cherry roll. 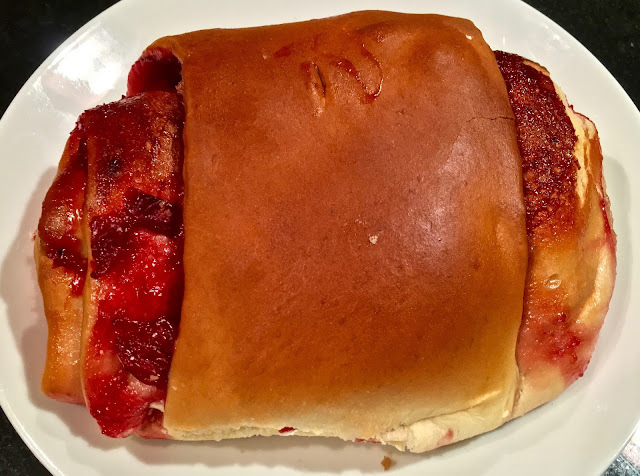 It is exactly that, cherry pie filling baked into a roll. The dough reminded of one you'd taste on a baked pork bun. It had that same sort of texture and slightly sweet taste. The cherry filling isn't too sweet, thus this isn't like a piece of pie or turnover, I'd say it is more reminiscent of sugar free cherry preserves spread on a roll. It is a big roll and at $3 a pop it still falls in the bargain sweet pastry range for San Francisco. If you are not a big sweets eater, besides not being overly sweet, it is quite big enough to cut in half and share. For the most part, I liked this enough. It was much better heated up, though in my own little mind, I kept thinking it would be so much better with butter or frosting or something. Of course, that is where my mind wanders when having a dessert that is okay, I keep thinking of ways it could be a sweet tooth wow in my for me. Guess I can always fall back on the eclairs since they are pretty good. 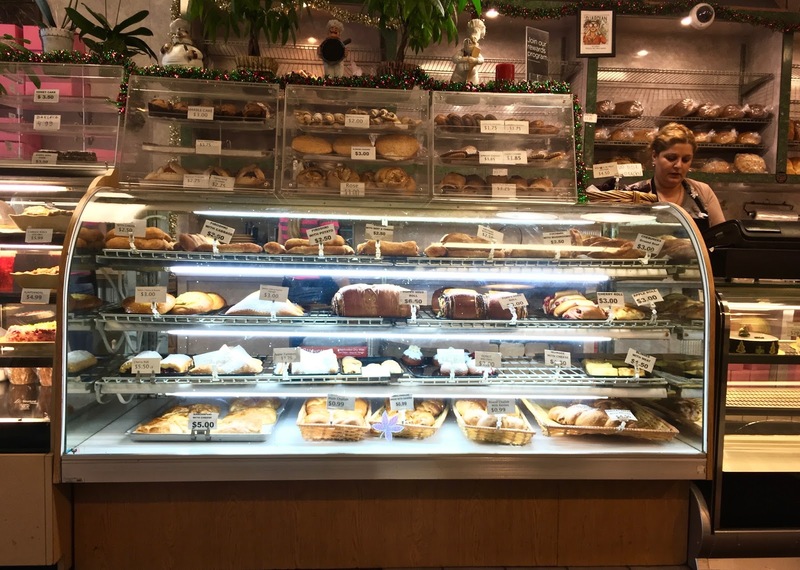 These are just some of the offerings at Moscow and Tbilisi Bakery. You can also get blintzes, challa bread, turnovers, donuts, cream horns, cake rolls, loaves of bread and more. They also do custom order cakes for birthdays and such. I guess now that I think about it, it is probably a good thing this place is clear on the other side of town. If it was anywhere closer, I'd probably be there most everyday and I'd be as big as a house. So for now, it will just be one of those places I treat myself to whenever I find myself out that way. I'm sure my waist and jeans will thank me for it.